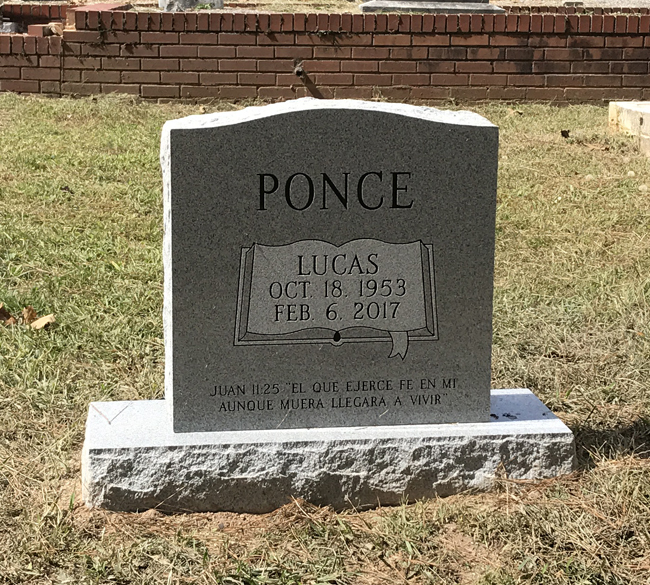 Lucas Ponce, husband of Alicia Ponce. Lucas Ponce, age 63 of Canton, passed away on Monday, February 6, 2017 at Saint Joseph's Hospital in Atlanta. The family will receive friends on Friday, February 10, 2017 from 4:00p.m. to 8:00p.m. at Darby Funeral Home. The funeral service will take place on Saturday, February 11, 2017 at the chapel of Darby Funeral Home with Rev. Robert Lopez officiating. Interment will follow in the Old Macedonia Campground Cemetery. He is survived by his wife, Alicia Ponce of Canton, his daughter, Ruth (Raul) Meza of Woodstock, his brothers, Martin Ponce, Emiliano Ponce Jr., Chencho Ponce, and Asencion Ponce of Homestead, FL., his sisters, Guadalupe Ponce, Margarita Ponce, Reyes Ponce, and Maria del Carmen Ponce of Homestead, FL., and his grandchildren, Naomi Delgado Ponce, Lucas Meza Ponce, and Mateo Maza Ponce. The caring staff of Darby Funeral Home is in charge of these arrangements.